Can credit cards be damaged by magnets? Can the magnetic strip on a credit card get scrambled or erased with a strong magnet? Does the direction that a magnet faces the credit card matter, north vs. south? Can I shield magnetic fields with some material? What about MuMetal, plastic, aluminum or steel? At what distance is my magnet safe from credit cards? What about RFID chips? Will strong magnets affect these devices? While we have a good idea about how these things should work theoretically, it seemed about time to try erasing cards with some magnets. This article describes our test results with some cards and a card reader, and provides some guidelines about how to avoid erasing a credit card accidentally. 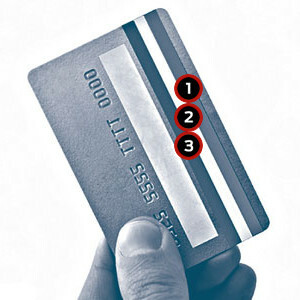 The magnetic stripes on many credit, banking and other types of cards use a strip of magnetic material to store digital data. A small amount of data is stored on the strip, including the cardholder's name, account number, expiration date, etc. Magnetic stripes were originally invented in 1960 by IBM to make purchasing with credit cards faster and allow greater use of computers during the process. The growing use of cards by banks, airlines and stores required a faster data entry method than rubbing carbon paper over embossed numbers! 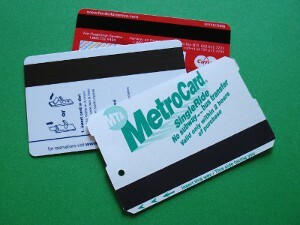 By encoding data on the magnetic stripe, data can be entered into a computer with a single swipe. To the computer, it’s the equivalent of typing the same information in, only faster. In fact, the inexpensive card readers now available look just like another keyboard to your PC. Plug it into a USB port and swipe a card, and the computer sees the output just as if you were typing the data in. Can you see the data on a magnetic strip? Iron dust makes the three tracks visible. You can't visibly see the data on a magnetic stripe. 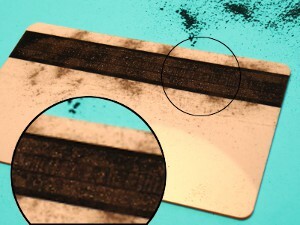 By pouring some iron filings or dust on a card, however, we can see vertical strips in the iron dust that indicate where the data is. The strip is like a tiny series of magnets, which interacts with the dust. In the picture, the vertical lines of the middle stripe (Track 2) are especially obvious, since they are more widely spaced than tracks 1 & 3. Can a neodymium magnet erase or scramble the data on a magnetic strip? Yes. If you rub a neodymium magnet directly across the magnetic stripe, with the magnet touching the card, the data is likely to be erased or scrambled. How strong must the magnetic field be to erase these magnetic strips? Black and silver stripes on the left are high coercivity, while brown stripes on the right are low coercivity. The thinner stripes only use Tracks 1 and 2, and do not include track 3. This thinner stripe is fairly common. The key to keeping cards safe is to keep a bit of distance between the magnet and the magnetic strip. Looking for a conservative, general rule that works for almost all magnets? Keep at least 1” between a magnet and a credit card, and 5-6” between a magnet and a low coercivity card like a hotel room key. This is true for even our most huge and powerful magnets; smaller distances can be safe for smaller magnets. How close can you bring a specific magnet to a magnetic stripe without erasing it? It depends on the size of the magnet. Let’s consider the case of a D88 cylinder magnet and a typical, high coercivity credit card. Theoretically, the stripe has to “see” a magnetic field of about 4000 gauss to erase it. 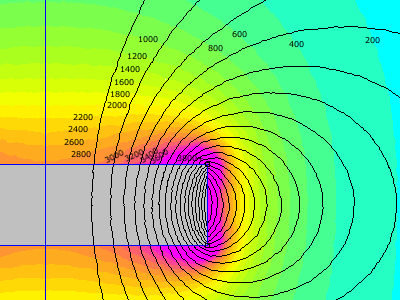 Using our online magnet calculator (or the formulas found in our article on Surface Fields), we can estimate the field strength at various distances from this magnet. Plugging numbers into the calculator, we find that the field strength is very high at the surface, about 5903 gauss. The field strength drops below 4,000 gauss at about 0.083” away from the surface. To test this, we move a magnet near the credit card at various distances. In the video below, we controlled this magnet-to-card distance by stacking some paper of known thickness on top of the card. Our test results agreed with the theory: At distances closer than about 1/16” away, we were able to render the card unreadable with this magnet. After rubbing the magnet 0.09” away, the card still worked great every time. After rubbing the magnet 1/16” (0.063”) away, the card sometimes gave read errors, sometimes not. In the video below, we did not get any errors at this distance. After rubbing the magnet 0.05” away, the card didn’t work at all. Below, we share a short video of our testing at these distances with a high coercivity card. Depiction of the magnetic field near the edges of a D82 disc magnet. What about a smaller magnet? A D82 magnet has a listed surface field less than 3,000 gauss. Will this magnet be OK at any distance? After rubbing the magnet 0.03” away from the magnetic stripe, the card still worked great every time. After rubbing the magnet 0.02” away from the magnetic stripe, the card didn’t work at all. What about a bigger magnet? We tried using a powerful 1-1/4” diameter x 1” thick DX4X0 magnet. Theoretically, the field strength drops to about 4,000 gauss at 0.18” away from the surface of the magnet. In our testing, we found that we had to get a little closer than this to wipe the magnetic stripe. After rubbing the magnet 0.2” away from the magnetic stripe, the card still worked great every time. After rubbing the magnet 0.15” away from the magnetic stripe, the card still worked great every time. After rubbing the magnet 0.125” (1/8”) away from the magnetic stripe, the card gave read errors sometimes. Are these estimates accurate in all situations? No, it depends very much on the details of your particular situation. The tests we showed here are for a single magnet near a single card. In some cases, multiple magnets can produce stronger magnetic fields than the single magnet examples we considered here. A pair of magnets with a small gap between them (as described in our Gap Calculator article) can produce a really strong magnetic field. Or, two magnets side by side (as constructed in our Magnetic Knife Holder) can provide a stronger magnetic field right at the intersection of the two magnets. You might also have a credit card sitting on a steel surface, instead of the non-ferromagnetic desk we tested with. A magnet sitting on a credit card, attracting to a steel surface behind it will make a stronger magnetic field at the card. 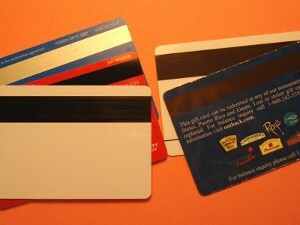 In each of these cases, stronger magnetic fields are more likely to damage a credit card. Can the strength of a magnetic field be lowered with shielding? Sure. A steel surface between the magnet and the card can reduce the magnetic field at the stripe. Learn more in our article about Shielding Materials. How much shielding is enough? It depends on the details of your setup. No, the direction does not seem to matter much. The strength of the magnetic field seems to be the important factor when erasing a credit card. The strength will be about the same whether you have the north or the south pole of a magnet near the card. I want to make a wallet or money clip. How can I make sure the magnet won’t hurt credit cards? The key to success is having some distance between the magnet and the card. For example, some disc magnets inside a leather wallet or purse like the D81 or D82 might need at least 1/32” thick material between the magnet and any credit cards that might get close to the surface of the material. If you are using our durable Sewing Magnets that are made specifically for this sort of closure, an absolute minimum of 1/32" of material is needed. For some safety margin, we recommend using thicker material, more like 1/16" thick. While we think this advice is pretty good, each situation can be a little different. Be sure to test your design thoroughly before putting any cards next to a magnet! For advice on magnetic closures, see our articles about Adhesive Backed Magnets and Sewing Magnets. What about RFID chips? Will strong magnets affect or disable these devices? No. RFID chips send out a radio signal, which is not affected by permanent magnets. While RFID devices can be powered by a changing magnetic field (by electromagnetic induction), they can not be scrambled, erased or blocked with a strong permanent magnet. If you are interested in the details of how bits of information are stored on a card, this appendix is for you. If reading about binary numbers and checksums makes your eyes glaze over, stop here. There really isn't any more information about how magnets affect magnetic stripes. That data is encoded as a series of ones and zeros along the magnetic strip. Think of it like a bunch of little magnets, arranged in a row along the strip. There’s some convention, like if the north pole is facing up it’s a one, and if the south pole is facing up it’s a zero. By reading the flip-flopping series of magnetization directions, zeros and ones are stored on the magnetic strip. This explanation is a bit simplified (and ignores some interesting details such as timing bits, that are used to sense how fast the card is moving through the reader), but that’s the basic idea. This is just like information is stored in zeros and ones on the hard drive of your computer, just on the back of a card. How is the data really stored? If you’re into binary numbers and checksums, here’s an example of how data is encoded on a credit card. Let’s walk through a short example with a short string of characters and convert it into ones and zeros. Most folks really don’t need to know this stuff – modern card readers do all this automatically. Why mention it here? What we find most interesting is the use of multiple checksums within the data, which help identify if the data has been scrambled. This means that if the stripe is somehow damaged or erased, you’ll tend to see it simply not work in a card reader, rather than providing bad data. Here’s the brief example: Let’s write a single word “MAGNETS” without the quotes. For track 1 of a credit card strip, we encode letters and numbers in a six-bit code with an added odd parity bit, as specified in ISO/IEC 7811-2. Without any error checking, we could just string these binary numbers together and write them to the card. However, this does not include any method of detecting read errors. Per the ISO standard, we include a few checksums to verify the data is correct. With these checks, if one or two of these bits (a 0 or 1 character) is off, we can usually see an error. First, each character’s binary string of digits is preceded by an odd parity bit. The new bit (0 or 1 number) is chosen to make the sum of the whole number's digits an odd number. If the sum of all of a character’s binary digits is an even number, this extra bit is a 1. If the sum is odd, the extra bit is a 0. The parity bit in the LRC row is an odd parity bit for the horizontal row of LRC numbers B5 through B0. Note that we reversed the order of the B0 through B5 digits in this last table. That’s the actual ones and zeros that get written to Track 1 of the magnetic stripe on the card.